To paraphrase from our esteemed VP, whether or not you like it, The Hunger Games is a “big effing deal.” Sure, he was referring to health care reform that has the potential to save the lives and fortunes of millions of Americans and I’m just talking about a movie sequel, but still… Francis Lawrence, the recently appointed and wildly underqualified new director taking over Catching Fire, has weighed in with one good move and one suspect one. On the plus side, Philip Seymour Hoffman, be he ever so jowly, is going to play Plutarch Heavensbee. On the potential minus side, Zoe Aggeliki, a former model, will play Johanna Mason. If it seems like I’m inappropriately invested in the casting of a young adult adaptation, it’s only because I am. In the wake of The Avengers becoming the most successful non-James Cameron movie ever, Disney has wisely decided to cash in on the animated side. The first joint Disney/Marvel (Disarvel? Misney?) movie will be Big Hero 6! Never heard of these folks? You’re not alone. 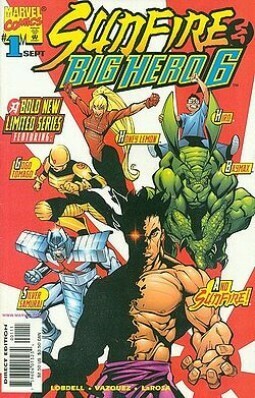 It’s a fairly obscure team of Japanese superheroes whose name sounds like it was badly translated into English. Maybe the first translation was “Super happy fun time hero people, yay!” No word if Pixar is involved (probably not) and no explanation why these, of all characters, was the first to get the kiss of the animated mouse house. While not technically movie news, I would be remiss if I didn’t comment on this moment of tragedy. TomKat, better known to non-douchebags as Tom Cruise and Katie Holmes have ended their contract…I mean, marriage. The national mourning has begun. Oh, not for the couple, but for the late-night TV monologue writers who may now have to actually try when making jokes.